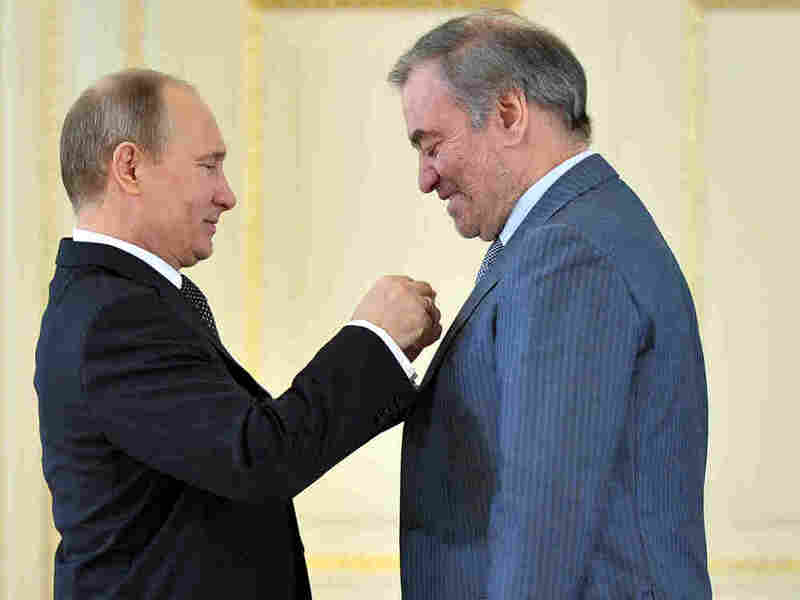 Valery Gergiev, The Powerful And Polarizing Maestro : Deceptive Cadence The conductor, slated to perform at the opening ceremony of the Sochi Olympics, sparked controversy with his recent comments on Russia's anti-gay legislation. The head of St. Petersburg's Mariinsky Theatre is a friend and ally of Russian President Vladimir Putin. Russian President Vladimir Putin (left) presents the "Hero of Labour" award to conductor Valery Gergiev, head of the Mariinsky Theatre. There are a lot of rumors, but officials of the Sochi Olympics are being tight-lipped about what's in store for the opening ceremonies. Among the artists expected to perform are leading classical musicians, a choir made up of a thousand children from all over Russia, and renowned conductor Valery Gergiev. 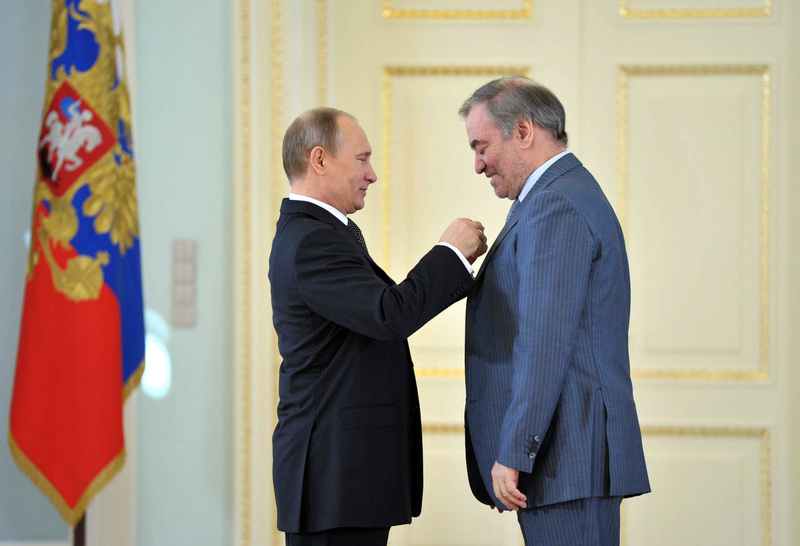 President Vladimir Putin named Gergiev one of the International Ambassadors of the Sochi Olympics. He is a powerful force in the world of classical music, but he is also polarizing. Gergiev is a formidable presence: tall, broad-shouldered and he often shows up for concerts uncombed and unshaven. He has strong ties to major orchestras throughout Europe and the U.S. including the London Symphony, New York's Metropolitan Opera and the Rotterdam Philharmonic. But Russia is where he has made his biggest impact. In 1988, when Gergiev was in his mid-30s, he took the helm of the historic Kirov Theater, a jewel of imperial Russia and the Soviet Union. The Mariinsky, as it's now called, has been home to Russia's greatest performing artists: Tchaikovsky, Shostakovich, Nureyev and Baryshnikov. In 1892, The Nutcracker received its world premiere there. It's been said that Gergiev runs the Mariinsky like a tsar. It's also been said that the institution needed the ruthlessness of a tsar to survive. When Gergiev took over, the Soviet Union was beginning to collapse, along with its funding of the arts. "Gergiev discovered those funds were not going to last," says Allan Miller, who directed a documentary about Gergiev. "He took the orchestra around the world to give concerts in order to make money for the theater." Gergiev helped raise the institution's profile around the world. The orchestra's 2001 recording of Stravinsky's Rite of Spring was praised by critics as reinvigorating a piece that was so overplayed it had lost its ferocity. Music critic Ted Libbey was on the panel that named Gergiev's recording one of NPR's 50 essential classical albums. "Gergiev turns back toward trying to evoke some of the brutality that is written into the music, that was designed to be part of the experience," Libbey says. "His guys just sail through this music. There's no question that they can play the notes but they go a little bit further." Gergiev is an unstoppable promoter of Russian culture, championing young artists who've become international stars, like soprano Anna Netrebko. He's also revived lesser-known works such as Rimsky-Korsakov's The Invisible City of Kitezh and Sadko, and Prokofiev's Betrothal in a Monastery and The Gambler. To further his dreams for the Mariinsky, Gergiev uses his significant political connections. He has known President Vladimir Putin for years. Miller, whose documentary about Gergiev is called You Cannot Start Without Me: Valery Gergiev, Maestro, says the friendship between the two goes back to when Putin was the first deputy mayor of St. Petersburg, where the Mariinsky is based. "He says, 'Of course I know Putin. I know him very well.' He admires Putin for his taking over when things were chaotic in the '90s, authoritarian though that might have been," Miller says. It's an affront to human dignity for anyone, including an esteemed Russian and international music artist, to align themselves with legislation and a regime that violates human rights. Gergiev was a vocal supporter of Putin in the last election and here's where Gergiev has infuriated human rights activists. Last fall a reporter for a Dutch newspaper asked Gergiev about Russia's anti-gay legislation which bans "propaganda of nontraditional sexual relations." Gergiev was quoted as saying "In Russia, we do everything we can to protect children from pedophiles. This law is not about homosexuality, it targets pedophilia." Shortly thereafter gay rights activists protested his concerts at the Met, shouting "Tchaikovsky was gay." There were also protests of his concerts at the Barbican Centre in London, where gay activist Peter Tatchell says he surprised the audience. "Dressed in the most stylish tuxedo I could find, I walked onto the stage while the orchestra was warming up and simply made a short statement criticizing Gergiev's support of the law," Tatchell says. "I was immediately pounced upon by security and eventually left of my own volition." Tatchell says he's experienced violent discrimination in Russia first hand. In 2007 he was in Moscow to support efforts to hold a gay pride parade when he was beaten by neo-Nazis and then arrested. "It's an affront to human dignity for anyone, including an esteemed Russian and international music artist, to align themselves with legislation and a regime that violates human rights," Tatchell says. Critics of Gergiev's see a certain irony in his loyalty to Putin. Throughout his career the conductor has been devoted to the symphonies of Dmitri Shostakovich, a composer who suffered greatly under Joseph Stalin's repressive government. New Yorker critic Alex Ross praised one of Gergiev's recent performances of Shostakovich's Eighth Symphony. But Ross also said he felt "psychological unease" at hearing Gergiev — a conductor who has made what he called "a pact with authority" — interpret the work of a composer who was terrorized by a dictator. Valery Gergiev has made statements saying he is not anti-gay and that he has never discriminated against anyone in his entire career. In an interview that aired on CNN this week, he went a little further, saying: "I myself question very much why the country needed something like this law. And I didn't even read it. Honestly, I didn't have time. I only learned about this law when things started to happen that I heard about." Gergiev also said he "can't imagine anyone in Russia wants to upset the world's community during the Sochi Olympics." The audio of this story, as did a previous Web version, incorrectly refers to Vladimir Putin as the mayor of St. Petersburg. Putin was first the deputy mayor of St. Petersburg, but not mayor.